You are currently browsing the Suburban Homesteading – Frugal Living blog archives for October, 2010. I’ve been thinking a lot lately about all the things we buy that could actually be made – by hand. I think about it at work, when I drive my truck and especially when I’m out running errands. I tell myself over and over again, “I could make that”, “Why do I need to buy it?” Yes – why do I need to buy something that is wrapped in layers and layers of plastic and then put into a cardboard box, when I have all I need right at home, bought and paid for, for a lot less than the final product? And so, my new motto has become “make it, don’t buy it”. From fresh baked bread to jams; from seasoned mixes to boxed rice substitutes; nesting boxes, sheep fences, garden shelters, I have been on a path of making what I need – myself – and doing a pretty fine job of it too. The best part is I don’t have all those “fake” ingredients and chemicals common in processed foods. Nor, am I perpetuating the slavish working conditions of factory workers in foreign countries. Won’t you join in and make a few more of your daily needs by hand? Rarely do I use boxed cake mixes, but when I ran across this recipe at a tasting a few years ago I knew I had to make an exception. The moist cake combined with the luscious creamy pumpkin butter makes it well worth the fudging. And, with your own homemade pumpkin butter it will be even better! Measure out and reserve 1 cup of cake mix. Mix remaining cake mix with ½ cup melted butter and 1 egg. Press mixture lightly into the bottom of a 13×9-inch baking pan. Mix pumpkin butter with remaining 2 eggs and 3 Tbsp of milk; pour over cake mixture in pan. 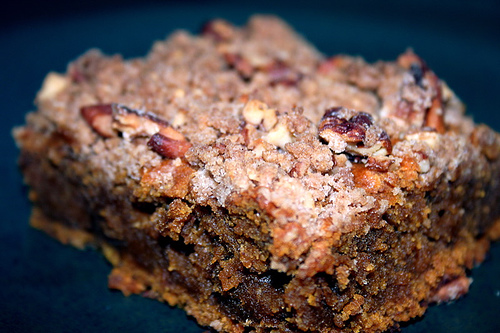 Mix reserved cake mix, 1 Tbsp of flour, ¼ cup sugar, ¼ cup of soft butter, pecans and 1 Tsp of cinnamon to a crumble. Crumble or sprinkle over top of pumpkin layer. Bake for 35 to 40 minutes. Cool, cut and serve. To make this seasonal dessert even more delectable top with a dollop of fresh whipped cream mixed with pumpkin pie spices. Yum! With fall in the air and Halloween just a few weeks away the pumpkin harvest in our county is in full swing. Beautiful orange globes of all sizes can be found in every farm stand, filling shop windows and decorating front porches. But what about eating pumpkins? 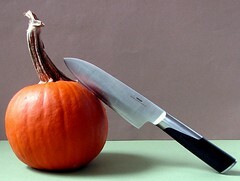 In the world of pumpkins, there are varieties that are prefect for carving – and those that are made for eating. That huge spooky-faced Jack O’Lantern may look great all lit up on Halloween night, but it isn’t the best choice for recipes that call for pumpkin. There are carving pumpkins and then there are eating pumpkins! While all pumpkins are edible, the larger varieties used for carving make poor cooking choices because they are low in sugar, have thin walls (which means less meat), and are stringy. Although, you can puree the meat of these pumpkins for soup or pumpkin bread, most pumpkin recipes taste better when using the smaller, sweeter varieties that weigh 3 to 6 pounds. Pumpkins with names like New England Pie, Baby Pam, Small Sugar, Trickster or Winter Luxury pretty much say it all. Eat Me!! Department stores may have dozens of ways to trick shoppers into spending more than they normally would, as described in this Daily Finance article , but they haven’t fooled this savvy shopper. Traveling down my path to a more frugal lifestyle full of experiences rather than stuff I have learned to spot these tricks and have a few of my own up my sleeve as well. I rarely shop major malls any more. I usually buy only what I need rather than trendy “want” items. And, when I do purchase items I favor second-hand or thrift stores over department or specialty stores. I’ve recently discovered the last Friday of the month sales at the Salvation Army in my sisters town. Each time I’ve been I’ve found wonderful quality clothing, house wares and furniture. I’m not much of a designer brand person. I would never pay those outrageous prices for a pair of jeans. But, if I can find good quality garments for a few dollars who cares whose name is on the tag. The greater point is to find items that will last for several seasons or several years. And that’s what I’ve done. On my last trip I found 3 pairs of Coldwater Creek jeans, in excellent condition, for $3 each; Land’s End long-sleeved t-shirts, great for wearing under my wool sweaters, for $1.50, a large ceramic mixing bowl for $2, 30-feet of garden fencing that will be perfect around new transplants or emerging seeds for $4, and an emersion blender, ideal for making pureed soups, fruit butters and of course smoothies, for $3. But, my savvy shopping doesn’t stop there. Ever get those $10 off cards or coupons in the mail or stuck to the Sunday paper? Well – if you’re a savvy shopper you can use them to your advantage, get what you need and not pay much (or anything) at all. I get them all the time and now have a few family members and friends that save them for me as well. I always carry a list of small items I need for the house. The trick is to have a list of items that are priced at $10 or just over. Wait for the coupons to come out and then buy only one of those items with each coupon. If they don’t have the item you’re looking for – walk out of the store. Don’t wander around trying to find a replacement. 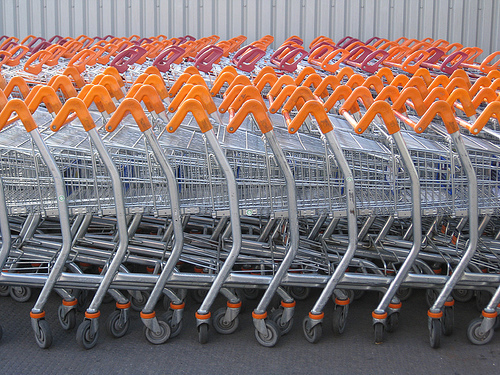 Retailers know the longer a consumer is in the store the more likely they are to make a purchase. In the last month or so I’ve been able to buy four seasonal pillar candles ($.84); two short-sleeved t-shirts ($1.30); a package of sport socks (free); a scarf (free) and leather gloves for my thrift store raincoat ($4), and a frame for my daughters county fair picture ($1.69). Not bad. Not bad at all. It’s a game and I’m playing it the best I can. Why spend good money on things that don’t matter? Why should I care what brand of jeans I wear while cleaning the garden or working the sheep. The truth is I don’t; don’t care to spend money on those things when it could go towards new livestock, our spring seed order or new equipment. So, come on, folks. Play the game with me. See how much you can save. See how frugal you can become. Tour an organic farm and learn why organic food is so important for the health of our bodies and our planet: Tune in this weekend when Maria Rodale and the Rodale Institute appear on the public television program Growing a Greener World. Use this link to see when the show will be aired in your area: PBS.org/stationfinder. Every station’s line-up and times are different. WJNSDT, NJN (New Jersey Network) will air the show Saturday, October 16th at 1:30 p.m.
Barnyards. Butcher Shops. & Blog Posts. It seems like all we did was run this weekend, but I know that isn’t true because I have the aching muscles to prove it. It all started bright and early Saturday morning. I woke to shattered dreams, delusions really that fall was setting in early. Whatever cool weather convinced me it could be so was now gone. I could feel puffs of hot wind coming through my open bedroom window, the telltale sign that the east winds were on their way; those hot, dry miserable winds that start somewhere out over the desert, carry dust and debris from hundreds of miles away and end up – well – here. I was not happy. But, life and farms go on. I received a call on Thursday. 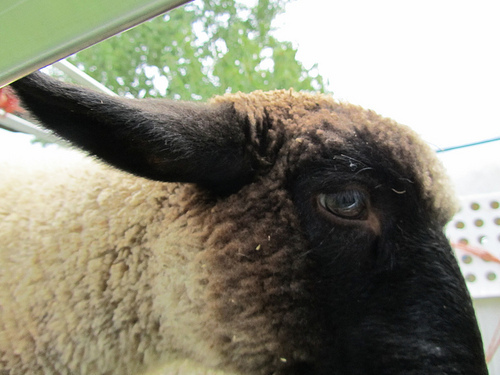 The lambs we dropped off Monday were ready to be picked up from the butcher shop. Not just any butcher shop mind you, an old fashioned butcher shop with coolers and freezers; smokers and sausage makers; hooks and knives and rails. All the equipment needed to custom slaughter and process both domestic and wild animals. And, all done right in plain sight. No back room processing here. When we dropped off our 4 lambs left over from the state and county fairs Kent was busy finishing up a truckload of grass fed beef from a rancher the next county over. Rather than stay until he had time to “do the deed” we put the lambs into a holding pen and went on about our day. It’s been a long time since I’ve butchered my own large livestock, but situations change and so must we. I doubt my neighbors would be pleased if they woke up some Sunday morning to the sight of carcasses hanging from the rafters of my garage or blood trickling down my driveway. I’m out of the loop on this one. When we arrived the shop was already bustling. Pick up trucks loaded down with deer and wild boar lined the small street waiting impatiently for their turn to offload. Matt, one of the cutters, and another worker quickly hooked the carcasses and hoisted them off the beds and onto the rail so they could be moved into the cool room. I know better than to get between a hunter and his prize so Brianne and I walked around the corner and entered the shop through the front door. Kent was on the phone, Brandi was packaging and labeling an order, and Gill was bringing out a pig to cut up. When Kent came out we talked briefly about the hunt, the fair, life, kids, school and sports. In 10 minutes we had caught up on the goings ons of our lives since we last talked three months ago. There wasn’t time for more. His little shop is busy this time of year. Between hunting and county fairs, custom slaughters and special orders Kent’s all about business. And, I can appreciate that, so to business we got. While Mark fetched the boxes containing our lambs I asked Kent how they looked. He threw me a “you’ve gotta be kidding” kind of look before saying “girl you sure know how to raise a lamb worth eating” and “I wish all the lambs I process looked like yours”. Brianne and I smiled. We were proud. With boxes loaded in the truck we headed back over the hill. Back to the work that lay ahead. Food on the table or new tires for the family jalopy? An easy answer for most people. But driving on worn tires poses a safety risk. So, too, can a mechanical breakdown that leaves a car and its passengers stranded on the freeway. Tough times can mean tough choices for folks struggling to make ends meet. Auto Club data suggest that drivers are skimping on car maintenance, leading to a variety of mechanical failures and breakdowns. During the first half of this year, roadside assistance calls increased by 7%, an unusually high number. Moreover, drivers are keeping their cars longer. In just one year, the average age of the nation’s cars has risen from 10 years to 11 years, an extraordinary increase, says John Nielsen, AAA national director of auto repair. Unfortunately, older cars require a higher level of maintenance to keep them running. The upshot? 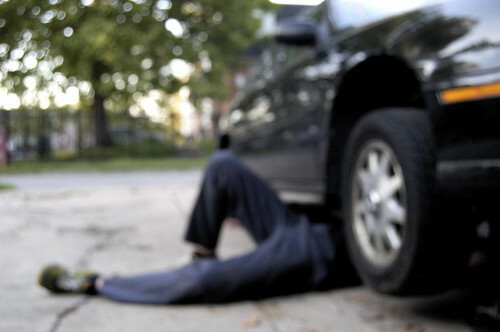 More motorists are experiencing firsthand the finite life of automotive parts. Skimping on basic maintenance is false economizing, because if you keep up with low-cost minor adjustments to your car, you likely won’t have to pay for high-cost major repairs later. Or, as the mechanic in an old TV commercial for oil filters said, “You can pay me now, or pay me later.” For instance, if you replace a car’s dirty fuel filter for $50, you could avoid the $500 bill you’d have to pay for replacing a ruined fuel pump. Spending several hundred dollars to change an engine’s timing belt is far less costly than spending thousands for an engine rebuild. And the list goes on. Outside of May, October is my favorite month. It’s a signal that the busy spring and summer months, that commandeered most of our time, are coming to a close and the quiet short days of winter are not far off. Fall’s light is dusky, it hangs low in a sky that is streaked with orange and pink and purple. It sends a glow across the homestead that I can only describe as breathtaking. But, with our Indian summer climate, October also marks the start of “fire season”. Not a season we look forward to. We are vigilant in our travels and tend to our chores that prepare us for winter. It seems with each passing year our weather stays warmer into the later months. I don’t know if this is global warming or not, but it sure makes homesteading a challenge. It’s warm enough to plant many kinds of vegetables, but the weather won’t hold and so I must…hold myself back from trying to sneak in one more planting of anything…hold back the gardener inside me. These are the months for replenishing the garden, a time where “garden keeping” is more important than garden planting, a time to put the garden to bed for the winter. The garden looks lonely in December. Gone are the vibrant colors of green things growing, of fruits ripening. The cold weather allows for only a few veggies to be planted – peas, spinach and lettuce. Our winters are not frigid, not like many areas to the north, but it is cold enough to drive us indoors. These are the days we concentrate on inside projects played out in front of a warm fire. We experiment with new recipes and try our hand at dishes we’ve never tried before. And, although these activities keep us busy, we can’t help but long for new lambs in the barn, chicks in the brooder, and a garden bursting to life. The months will go by quickly – and then – we’ll be out in the sun again; reliving our routine of homestead life. And we are glad.